Between 5.00 â€“ 7.00 pm on Friday 9thÂ December 2011 campaigners will assemble at Speakers Corner and make their way via Marble Arch and Oxford Street to the US Embassy London.Â Â They will be there to demand the unconditional and immediate release of Mumia Abu Jamal. 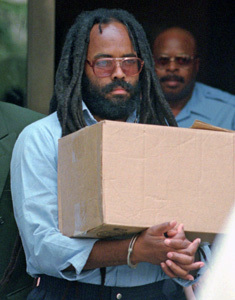 This date marks 30 years since Mumia Abu Jamal was arrested and imprisoned in Philadelphia, USA.Â Â Â Accused of murdering a police officer, the journalist and former Black Panther Abu-Jamal has always stated his innocence.Â Â Following his conviction he languished on death row under a sentence which has now been ruled unconstitutional. Earlier this year US Court of Appeal, Third Circuit, Philadelphia, USA set aside Abu-Jamal’s death sentence because of procedural irregularities during his trial.Â This decision has since been upheld by the Supreme Court, automatically reverting the sentence to life imprisonment. In order to reinstate the death penalty at this point, the District Attorney would have to call for a new penalty-phase trial, with a new jury having to decide on whether to reinstate the death sentence. Otherwise, the sentence of life in prison (without parole) remains. UK campaigners are joining others in France, Africa, US and internationally who are actively calling for his immediate and unconditional release.